Ee just had our first snow of the season. For reasons I am too embarrassed to discuss, she has no winter boots. It’s mid 20s and sunny, slightly breezy. My winter short hike gear is my rain pants over my jeans. Her brand new rain pants are perhaps 6 inches too long. Heck, we can roll them up. Wool sweater, wool hat, wool mittens (all knit with love by her mom). We discuss our hike refreshments (Z-bars and water), and I remember that I bought a Platypus bottle and drinking tube for her. Fill that up and add it to her pack. I fill my Camelbac Mule, and we’re off. 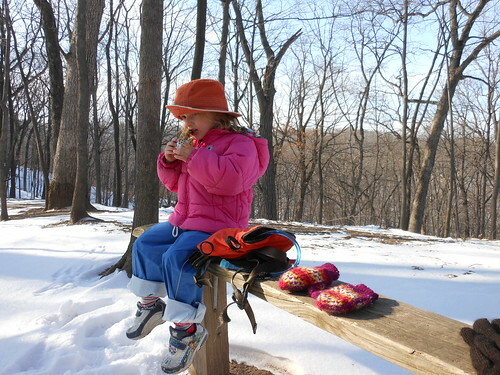 Arrive at the trailhead, zip her up, help with mittens, and why are you wearing your sun hat? Put your warm hat on. She doesn’t want to wear two hats, please would I carry ducky hat? Fine, either she’ll get cold, and I can tell her that’s why I wanted her to wear her warm hat, or she won’t and she’ll be fine. There’s enough traffic that the trail is already nicely tramped down. This reassures me as she goes stomping through snow over her ankles in sneakers. She loves snow. She tries to make snowballs (not sticky enough). She identifies footprints (“people, people, people, deer or turkey, people, me!”). She asks why the snow sparkles, and then dances up the trail stomping on every sparkle she sees. 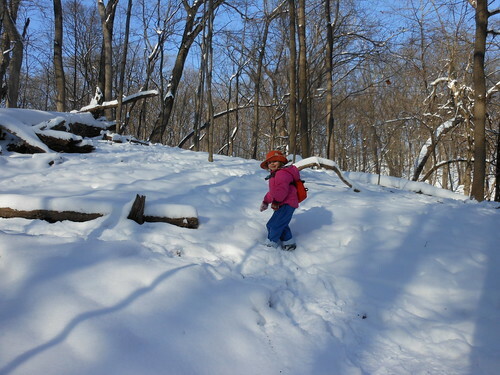 Going up the switchbacks, she gets so involved looking at squirrel tracks that she follows them a few steps off the trail into the deeper snow. I’m glad I put her in rain pants. She’d be exhausted already in snow pants. But she falls down every other step, both from slipping and because she thinks it’s really funny. Near the top of the hill, she complains that her foot itches. “Nothing we can do. Keep walking.” I’m so nurturing. At the section along the ridge where she usually runs, she starts whimpering because of her itchy feet. I have her sit on a bare spot and take her shoe and sock off. She’s got a tiny cut on the back of her heel. I pull one of the favored colored bandages out of my pack. The other heel is worse. Cause of damage is likely her jagged, razor-sharp toenails. I make a mental note to bring nail nippers on overnights with her. Blue bandages applied, she happily jumps along the ridgeline. “Side to side, side to side!” she zigzags in front of me. At the listening point bench on top of the hill, we stop for a snack. She nibbled a Z-bar and has 2 raisins. I ask if she’s thirsty, and she manages to drink from her tube by herself. We need to tweak its clip point, but not in the snow. She admits to being cold and doesn’t complain about the warm hat now. Down hill is slicker. She falls almost every step, but laughs every time, too. She pretends I’ve never been here, and tells me where we’re going, what’s going to happen, etc. And then, her feet get cold. I feel horrible, because I haven’t even brought dry socks. I put her up on shoulders and stick her feet in my armpits. She sings loudly about jelly beans. An hour after getting out of the car, 5 minutes after she gave up on her feet, we arrive at the nature center. I make her take her hat, mittens, and coat off. I take her shoes and socks off and realize that there’s a ring of ice around her ankles in the rolled cuffs of her rain pants. She gets a cookie and hot chocolate and settles on the floor of the store, where she is introduced to all patrons as “our youngest volunteer”, draws a picture, schmoozes enough food for a meal, and generally has a fabulous time. What do you like to do on your winter outings?